Football Scores 24 has just launched a brand new free extension for Chrome which enables football fans to stay up to date on all the latest developments from virtually any football game in the world. The extension provides live updates on goals, red and yellow cards and substitutions complete with sound alerts and notifications from matches in a huge range of leagues which are fully customisable. 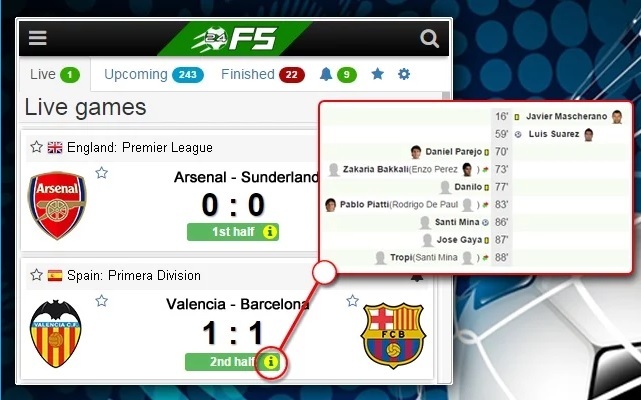 All users of the extension have to do is select which teams, matches or leagues that they want to follow and they will begin to receive notifications. The extension will also remind users when one of their favourites is about to start a match so that they can be sure of not missing anything. Furthermore, it also gives users access to the betting odds for all upcoming matches and the users can visit the bookmaker’s page and place a bet with just a few clicks of the mouse. Even when matches aren’t taking place the extension is extremely useful. You can visit the ‘Live’ tab to see which matches are currently taking place throughout the world while the ‘Upcoming’ tab will display which matches are taking place that day as well as providing betting odds on all matches. There is also a ‘Finished’ tab which displays the results of matches that have recently finished. You can click on any of the matches and then be taken to the Football Scores 24 game preview page where they can then find further information about the match such as more information on the teams and their latest results. The extension looks to be an invaluable tool for all football fans. Whether you support teams in major leagues such as the English Premier League or more obscure leagues such as the Botswana Premier League the extension has them all covered. It is a brilliantly unobtrusive way to stay informed on all the latest happenings from the football world. It is possible to use it at work, at home or in any other situation, and receive live updates without having to keep a particular web page open and checking it on a regular basis. The extension is now available in the Chrome Web Store and it is completely free to use.